Adele's thoughts on the Escapade, and the WTB Road Plus concept. "There have been so many rides on my road bike where I’ve fancied turning on to a favourite off-road trail but knew I’d be shaken to pieces and effectively brake-less, and mountain bike rides that took in a road or gravel track where I’ve almost spun my legs off trying to pick up some speed. So when Cotic loaned me this Escapade with WTB Road Plus tyres and hydraulic disk brakes – a ‘road bike without limitations’ – I was intrigued to find out if it could be that elusive happy medium." "The Cotic Escapade uses the WTB Road Plus concept: and everyone who sees the bike immediately asks about it. Road Plus uses 650b rims, paired with big volume, 650 x 47 tubeless tyres (smaller rims and bigger tyres thus giving a similar diameter to a more usual 700c road wheel), which you run at 35 psi. The combination delivers a cushioned, smooth ride and grip on rough surfaces and mud due to the wider contact patch, yet features a tread pattern that rolls fast on smooth roads. It isn’t a new system (I believe it was popular with French roadies in the ’60s!) – but it is quite niche, and enjoying something of a revival." "My first rides were spent trying different conditions off-road: mud, stony tracks, roots, climbs, descents. While the Escapade may not have the ‘armchair’ comfort of a full suspension mtb, the Road Plus wheels deliver a smooth, sure footed and fast ride on forest tracks, mud, and and over roots. It can handle singletrack too, making light work of berms and roll-down drops. My only ‘I’m slightly out of control here’ moments were while descending over some very loose stones (thank goodness for those disk brakes as we reached the bottom!!)." "On my fourth ride I entered the Surrey Hills Gravelcross CX sportive – it was chucking it down with rain (and I was driving up North in the afternoon) so I limited myself to the 30km category and was very happy (amazed, in fact) to come home as the fastest female in the category. Even in slippery, deep mud the wheels worked really well – although there was one mud-chute descent that we slid down instead of rolling, but I hung off the back and we stayed upright. 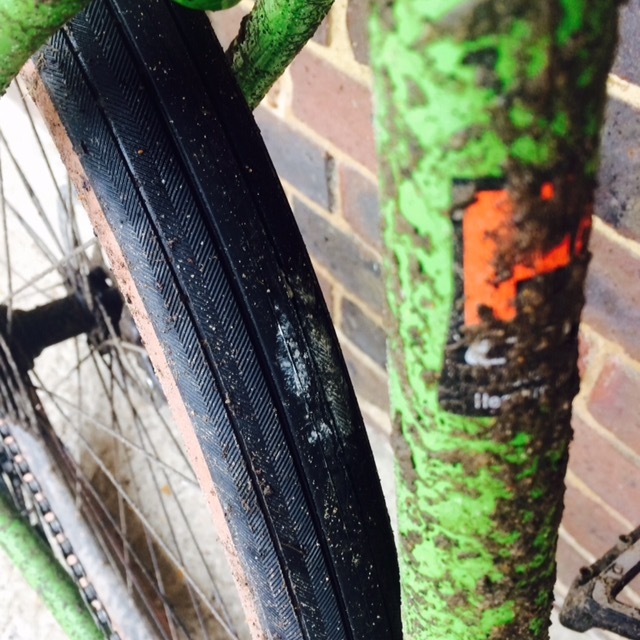 The tubeless tyres came into their own – as you can see from this post-ride picture. As a mountain biker I know all about the joy of a tubeless set up, but back at the event HQ it was a source of endless fascination to some of the roadies – especially the ones who had punctured a couple of times during the event and had to swap inner tubes in the pouring rain." "What are the limits? There are definitely some mtb trails which I will detour around, largely due to lack of skill and a sense of self preservation – though I’m sure there is someone out there who rides their Escapade round Bike Park Wales in a blindfold. But for a quick blast round the lanes, bridleways and fire roads, a trip to town, a long ride down to the coast on a mix of terrains, or for just turning right on a road ride and having a lot of off-road fun … then yes – it ticks all the boxes."